Spotify is yet to file its numbers for 2016, but it seems likely that they’ve leaked. A new report suggests that Spotify investors have been told to expect annual operating losses between €300m and €400m ($332m+) – with yearly revenues at €2.9bn ($3.2bn). 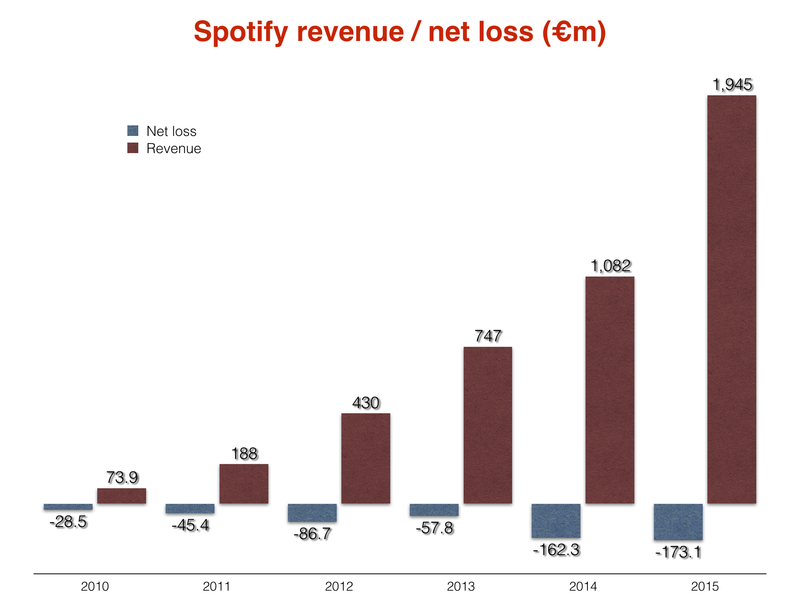 That would represent a 49% jump in turnover on the €1.95bn ($2.2bn) in revenues Spotify posted for 2015. However, it would also mean losses had widened by at least 64% (at €300m) compared to the €184m operating deficit we saw in 2015. The source of the new figures is well-connected subscription tech business title The Information. Remember, these numbers are as yet unverified. MBW has asked a Spotify spokesperson for comment. In 2015, Spotify’s revenues (+80%) grew significantly faster than its net losses (+7%). Spotify was recently valued at $13bn, and is believed to be pushing ahead for a direct listing on the New York Stock Exchange.